Wouldn't it be fun to bring your pet to school? Now imagine if EVERYONE brought their pet to school! That's exactly what happens in this hilarious picture book--and it gets pretty wild! A lighthearted way to tackle classroom etiquette with new students. 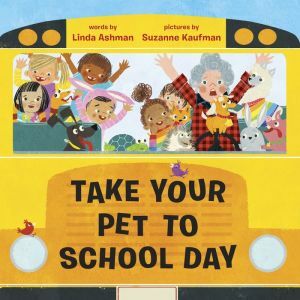 Linda Ashman's bouncy, rhyming text lends itself perfectly to an exuberant classroom read-aloud, and Suzanne Kaufman's playful art is full of hilarious details. A great way to generate enthusiasm for school, this book will easily find a place in pet lovers' hearts.